To kick off this year’s Twelve Beers of X-Mas, I’m tasting The Mad Elf Ale, a beer described as cheerful and jolly, which seems appropriate. The Mad Elf, a specialty ale brewed with honey and cherries, is made by Tröegs Brewing Company in Hershey, Pennsylvania, my friend Nate’s favorite brewery. The cherries impart a strong ruby red color to this beer. The head is a creamy off-white, but it doesn’t last very long. The aroma is quite subtle, just a bit of caramel and toast and a hint of cherry. As it warms a little more comes out, though it remains quite mild. The flavor is remarkably light and clean, particularly for an 11% ale. I suspect it’s brewed with a Belgian strain of yeast, as there’s a clove spice and fruit character reminiscent of many Belgian ales. 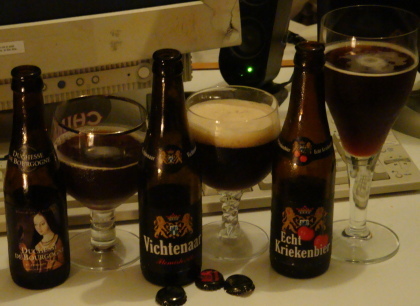 Following that is a bit of caramel malt and a light cherry tartness, rounded out by a strong alcohol warming. Like the nose, the flavor grows as The Mad Elf warms, so I’d suggest serving it on the warmer side, towards 55 degrees Farenheit or so. The mouthfeel is smooth and creamy, with a bit of a lasting sweetness. The cloves and alcohol linger as well, so it’s never quite cloying. 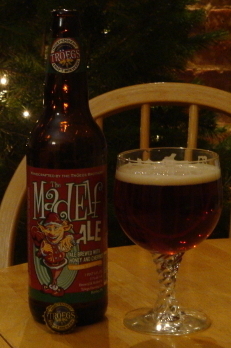 Overall The Mad Elf is a flavorful but easy drinking winter warmer. Enjoy it by the fire (or in my case, the space heater).